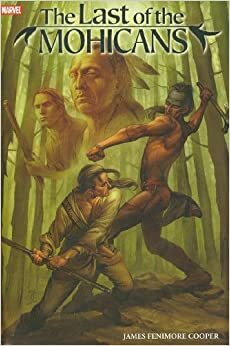 The Last of the Mohicans (Marvel Illustrated)The very first Marvel Illustrated story, The House of Ideas' new foray into classic literature, featuring an adaptation of James Fenimore Cooper's renowned novel! Last of the Mohicans tells the seminal story of a race on the brink of disappearance due to the inexorable push of civilization into the wilderness of the New World. It's a tale that will touch readers of every age with both its timeless realization of an important historical period-and with its powerful action and adventure! This isn't your father's classic comics! Adapted by writer Roy Thomas, who's a Marvel classic himself (Avengers, X-Men, Conan) with stunning art by Marvel newcomer Steve Kurth. Collects Marvel Illustrated: Last of the Mohicans #1-6. Comment: I haven't read the first comic, but I read and reported on the second series years ago. Well, on the first issue of the series, anyway. I wasn't interested enough to keep reading. For more on The Last of the Mohicans, see First of the Tonto Tales.